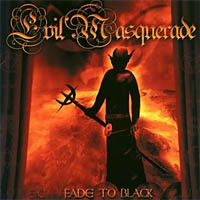 Evil Masquerade released in 2006 their latest album "Third Act". David Rosenthal did a guest appearance on the track "Far Away". The Danish outfit led by guitarplayer Henrik Flyman now is back with their new album "Fade To Black". And again we see an ex-Rainbow keyboardplayer having a guest role. Tony Carey brings us some excellent keyboardwork that reminds us of the Rainbow Rising album in the opening track "Ligts Out". On the rest of the album we hear another 9 excellent European melodic metal tracks with often an excellent Rainbow vibe. Great guitarwork by Henrik Flyman that has a touch of Ritchie Blackmore and also the singer Apollo Papathanasio sounds very good. He sounds like a mix between Ronnie Dio and Tony Martin at times. It might be clear you'll get a modern but also very Rainbowesque sound. Henrik also plays the keyboards on the rest of the album. In "Diamonds Dusk" we hear again an intro that sounds very much in the Rainbow's "Gates of Babylon" vein. So the conclusion is that Evil Masquerade has released some months ago already a great solid piece of metal with a fine Rainbow feel. Besides before Tony Carey went out on the road with Over The Rainbow he proved already he still had it in his fingers on this album's opener. We were very surprised by Taz Taylor's "Welcome To America" album that was released in 2006. Mainly because we heard Graham Bonnet on vocals doing a splendid job ofcourse. Taz also showed us being a very talented guitarplayer. In 2008 he did an European tour with Graham on vocals. After the tour Bonnet left the Taz Taylor Band. Taz Taylor has found in Keith Slack a new singer. Keith has sang in the past for Steelhouse Lane and MSG. Since Taz is pretty much influenced by Michael Schenker it's not a big surprise the new singer just like Graham also has a background with the German axehero. Keith's voice is a lot bluesier than Graham Bonnet. The result is this album breathes a certain Whitesnake feel at times. In songs like "One More Night", "What You Need" and "In Harms Way" it's the first thing that comes to mind. It sound like we remember David Coverdale and the Whitesnake 80's sound. In other songs we hear a good 70's/80's European hardrock style that sounds like a mix of Thin Lizzy, UFO, MSG and Rainbow. Taz not only plays the guitar very well. On this album he also handles the bass and some keyboards. Drummer Val Trainor is the only one who is left of the line-up of the last few years. Don Airey, who played in the past with Rainbow, Whitesnake and (yes there he's again) Michael Schenker plus a million others, does a guest appearance on the instrumental title track "Straight Up". He delivers some very fine piano and keyboard work. Although Keith Slack can't make us forget Graham Bonnet, he does a fine vocal job. The powerful voice has been replaced by a more bluesy and soulful one. Just like Ritchie Blackmore did when he replaced Graham by Joe Lynn Turner in 1981. 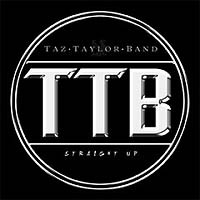 This new Taz Taylor album has 11 steady songs. Although it doesn't bring us real surprises, it's an enjoyable and good hardrock album. 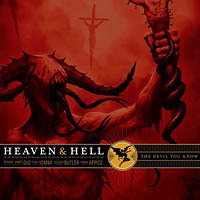 After the compilation "The Dio Years" (with 3 new tracks) and the live registration "Live In Radio City Music Hall" (on both CD & DVD) it's now time for a new studio album by Heaven and Hell. The band that already recorded and toured in the early 80's and early 90's as Black Sabbath decided to give it another go in 2006, no longer as Black Sabbath but as Heaven and Hell. That was the title of their debut and most succesful album featuring Ronnie James Dio on vocals. The new studio album has been named "The Devil You Know" and brings us the well known heavy doom sound Tony Iommi and his band has been palying since the start. There are hardly any surprises. Most of the tracks are midtempo, only "Neverwhere" and "Eating the Cannibals" are more uptempo. Tony Iommi shows he's still the riffmaster. The rhythm section duo Butler and Appice put down a heavy concrete carpet. And Ronnie James Dio proves he's still able to deliver strong vocals. Maybe not as strong as in his Rainbow days but he sounds still amazing for a guy who's far in his 60's. Howard Leese is best known as guitar player for Heart which he joined in 1975 and with whom he stayed for 22 years, Leese co-produced some of their 13 albums. Heart had 20 top 40 singles, 3 International no. 1 singles, a no. 1 album ("Heart") in 85', has received 4 Grammy nominations and has sold 40 million records worldwide. 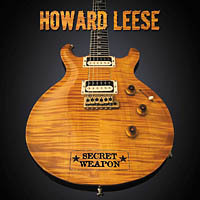 Howard Leese has often been called "Heart's secret weapon". His debut solo record will be out next month. It's titled "Secret Weapon". Howard got himself the help of several wellknown names in the music industry including Joe Lynn Turner, Paul Rodgers, Keith Emerson, Jimi Jamison, Paul Reed Smith, Deanna Johnston, Keith St. John and Andrew Black. In the opening track "Alive Again" we hear Joe Lynn Turner. The song sounds quite a bit like Bon Jovi's "Wanted Dead Or Alive". Good track with excellent vocals by Joe Lynn Turner. The second track with Joe Lynn Turner on vocals is "Hot To Cold". Good rockin' AOR track, Joe does a duet with Deanna Johnston. She is best known as a contestant on the reality television show Rock Star: INXS. It's the 3rd track on the album. Inbetween the two tracks with JLT on vocals is "Heal The Broken Hearted" sung by Paul Rodgers. Fine performance by one of the best voices in rock. Later on we hear also the voice of Jimi Jamison (ex-Survivor), another great singer on a typical slow AOR song called "The Vine". These are the 4 best tracks. For the rest there are some good songs plus instrumentals with some nice laid back playing. The album ends with the instrumental "Somewhere" (Theme From West Side Story) which is very nice to hear.